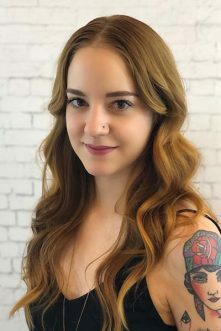 Amy Hudson - Fringe / A Salon Inc.
Amy began her career as a stylist in 2007 graduating from Douglas J. Aveda in Ann Arbor, MI. She then ventured to Chicago continuing her education through any class available to her. She frequents New York City for intensive training at the Redken Exchange. Amy strives to educate her guests on the necessary tools and tips to recreate their new style at home. She enjoys creating “lived-in” looks utilizing balayage techniques, natural highlighting, and enhancing natural texture. She also takes pride in styling creative cuts, designing fantasy hair, and executing color correction. In her free time, she enjoys baking vegan treats, going to the movies, and hanging with her two cats Pickles & O.G.